Although the three Team Penske cars make up the Top-Five, it doesn’t quite feel like they are dominating as much as they did last year. If you’ll recall, the four Penske cars took the first four spots in qualifying but did not win the race. That honor went to Chip Ganassi Racing’s Scott Dixon. 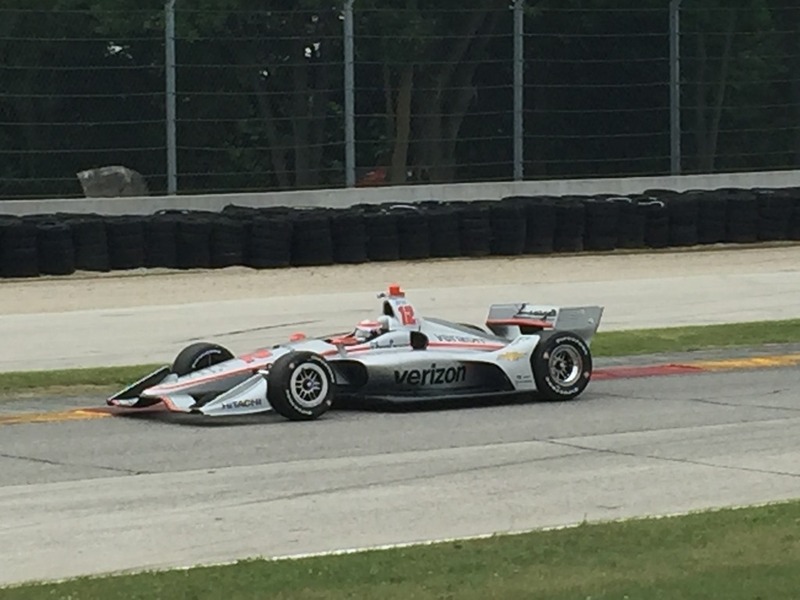 By the end of the second practice today, Josef Newgarden was quickest with a time of 1:42.628. 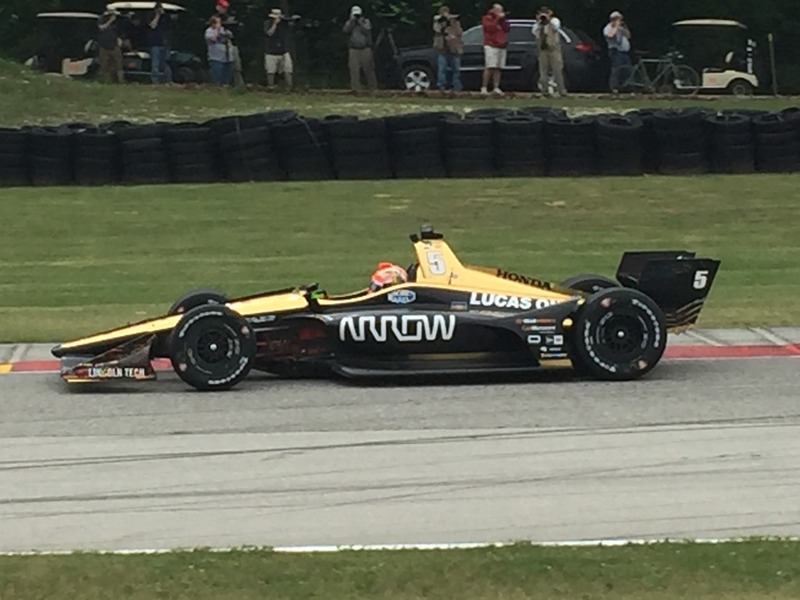 But Robert Wickens of Schmidt Peterson Motorsports was less than three tenths of a second slower. Sébastien Bourdais was third quick for Dale Coyne Racing before Will Power and Simon Pagenaud finished fourth and fifth quick on the day for Team Penske. That’s three different teams and two different manufacturers in the Top-Three. Yes all three Penske teams are fast, but you don’t get the feel that they are just going to run away with Sunday’s race. Tomorrow could get very interesting. The three Penske cars are the only Chevy-powered cars in the Top-Ten. The bottom half of the Top-Ten are the Honda Powered cars of Graham Rahal, Scott Dixon, Ryan Hunter-Reay, Takuma Sato and Marco Andretti. This morning we went to the southwestern-most quadrant of the track and watched most of Practice One from the Carousel – the long sweeping right-hander that leads into The Kink. 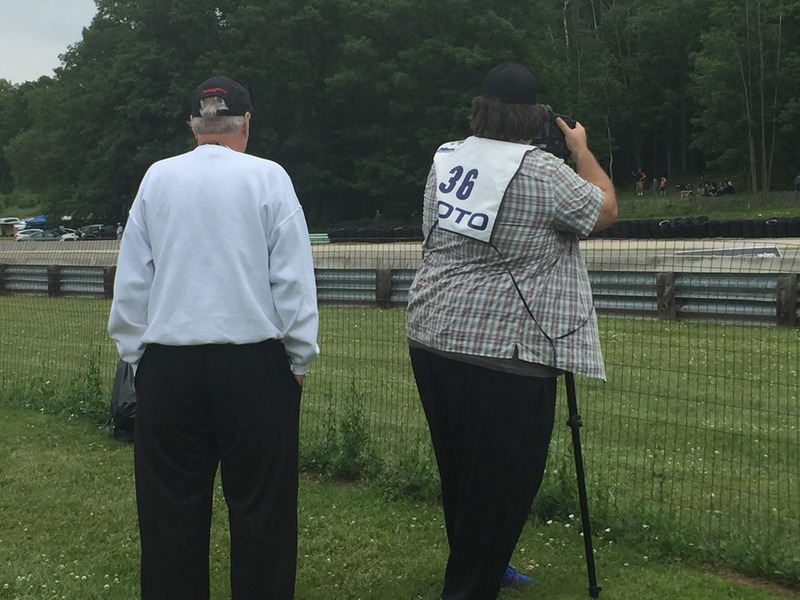 While sitting there relaxing and watching the cars go by, I looked over and saw Robin Miller and Marshall Pruett from Racer.com pretty much doing what we were doing – just taking in practice and watching cars go by. Is there a better way to send a Friday morning? The afternoon practice was longer and gave us an opportunity to go around to different vantage points. I gave Susan a new camera for her birthday a couple of weeks ago, so she was anxious to try it out. She has gone crazy taking pictures of anything and everything here. You will see them sometime in a post over the next few days. We started out at Turn Five, which is one of the premier points to watch the race, due to the overtaking that can take place there. Unfortunately, it’s not ideal for taking pictures due to the high fence. We stayed there for a while and then went up the hill, crossed the Corvette bridge and found a spot as they are coming out of Turn Six before heading toward the Hurry Downs portion of the track. The cars just climbed a hill so they are going relatively slow. There is also no fence to obstruct your view so it is a great place to photograph from. 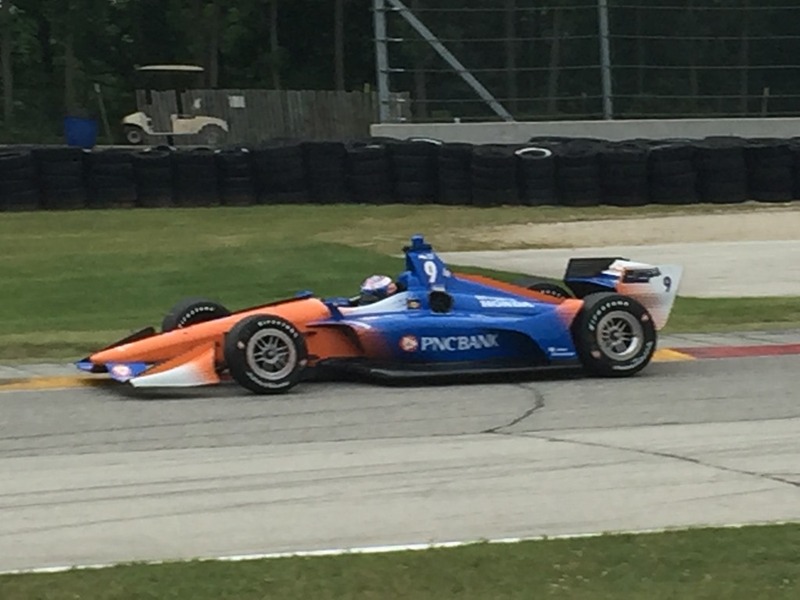 I took a few pictures myself along with a video of Marco Andretti going through that section. From there, we went to the northeastern corner of the track to the last turn on the track; Turn Fourteen, which leads onto the main straightaway. I was playing with my phone and took a slo-motion video of Simon Pagenaud going through the turn. I’m not sure it tells you anything about his line, but it was fun to play around with that seldom used feature. That’s going to do it for us today. I think we are going to eat dinner at a place we went to two years ago for their Friday Night Fish Fry. One plus for the place is that they sell Spotted Cow Beer. If that’s where we end up going, I’ll tell you about it tomorrow. Remember…half the fun of coming to Road America is the food. I hope to be here early tomorrow for another full day at the track. Thanks for following along today and check back again in the morning. This entry was posted on June 22, 2018 at 6:39 pm and is filed under IndyCar. You can follow any responses to this entry through the RSS 2.0 feed. You can leave a response, or trackback from your own site. I was not able to make the race this year but your photos, videos, and commentary are almost as good as being there. I have some brats soaking in beer for cooking tomorrow. Good read. Spotted Cow, Yum! Hard to come by here in Nashvegas. Thanks for the photos and videos. The photo of Robin and Marshall looks like the back of Mt. Rushmore. Looking forward to yours and Susan’s continued coverage.